Almost all residential roofs are framed using prefabricated trusses rather than more traditional conventually framed ridge beams and rafters. As noted above, truss roofs offer speed and labor efficiency and are designed by truss manufacturers using simple computer programs. The framing members are then prefabricated and delivered to the jobsite to be erected as an interlocking framing system. As an alternative, traditional roof framing is field fabricated, maximizing the use of the space under the roof, but it also requires more time and attention to detail than component or truss framed roofs. 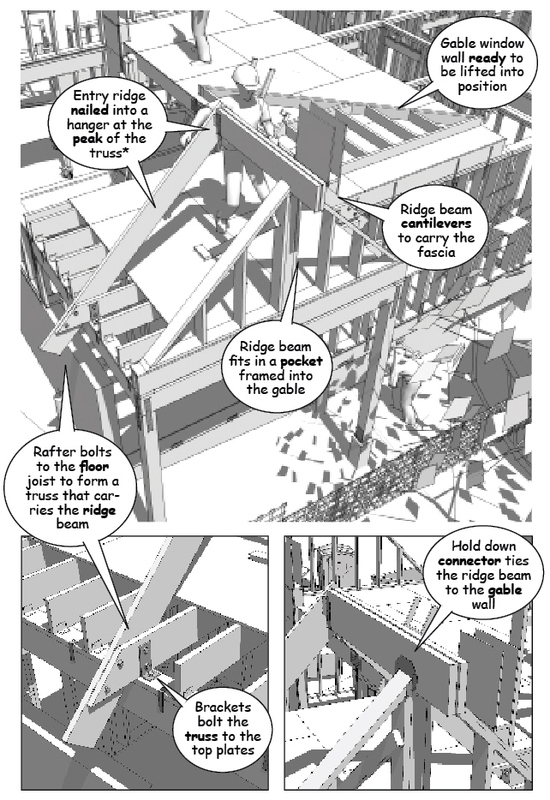 Engineering is also more complex with roof slopes, spans, and the thickness required for insulation governed by the depth and spacing of framing members. Traditional framing takes both experience and carpentry skills not often found in production residential construction. It is shown here for educational purposes. Though not difficult to build, this type of construction is best assembled by seasoned builders working for owners who value the space and visual interest of open ceilings and clerestory windows. Once the top plates and loft framing are in place, sheathing is added to the outside of the exterior walls to stiffen the frame. The sheathing is nailed to the studs and plates to resist lateral loads and uplift forces from wind and earthquake. 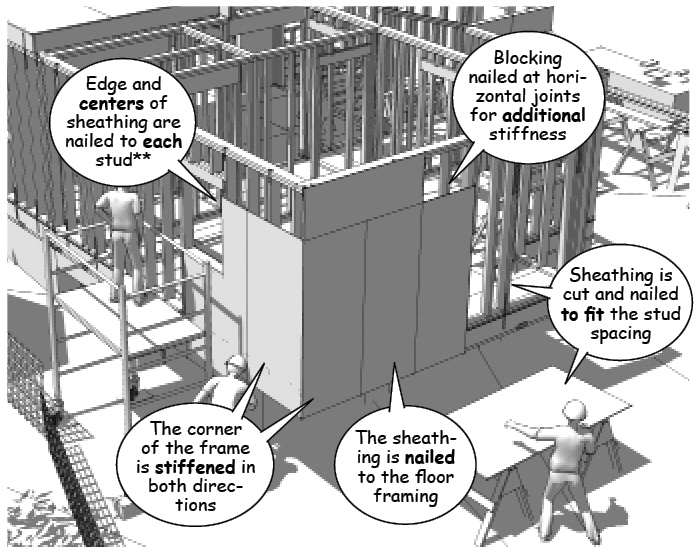 The spacing of nails along the edges and centers of the sheathing varies with the anticipated loads on the structure. Spacing is determined by engineering calculations that take into account the location, exposure, and wind and earthquake requirements of local building codes. The entry roof is a good example of the geometry of the traditional roof framing method. Note that the framing members form simple triangles with the floor or ceiling joists acting as the bottom chords of the truss and the rafters acting as the top chords or hypotenuse of the triangle. 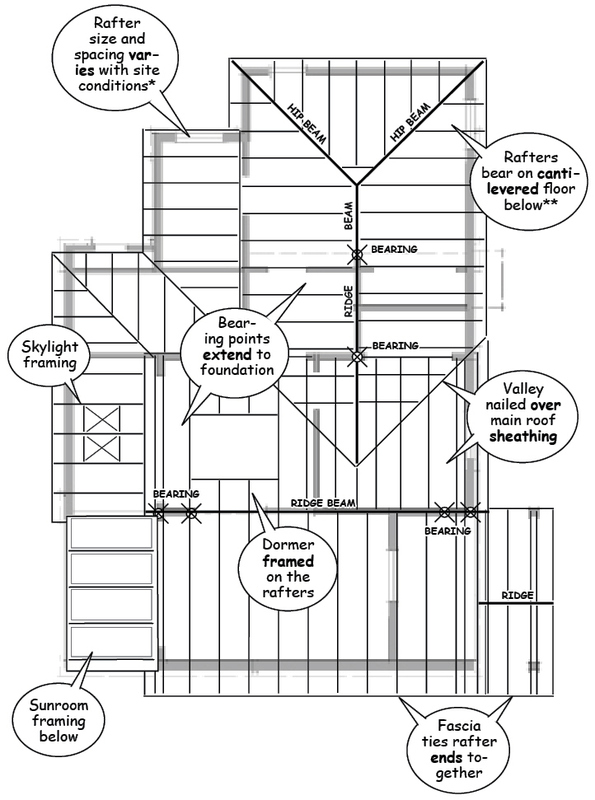 Shear walls extend from the foundation tie-downs up through the loft floor, all the way to the ridge beam in order to unify the structural system. 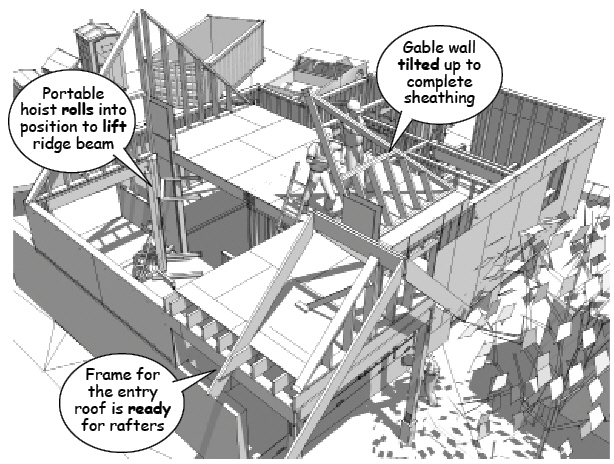 Note that fall protection become increasingly important when framing a traditional roof, making safety and careful planning primary concerns during this phase of the construction.